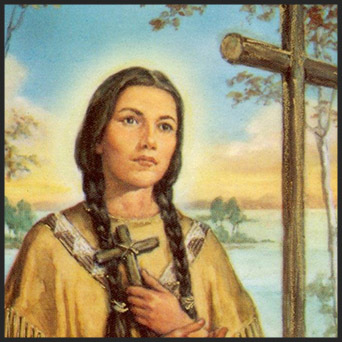 If you’ve ever felt out of place amongst your family or friends for being Catholic and living out your faith, you and St. Kateri have that in common. Known as the “Lily of the Mohawks,” Kateri endured the death of her family, illness, persecution and exile before she even turned 25! She is the daughter of a Christian Algonquin and a pagan Mohawk chief. She became an orphan at the age of 4 when both her parents and only brother died of smallpox. Although she survived and recovered from this disease, Kateri was left partially blind with many scars on her face. From a young age, Kateri made a vow not to marry because she was convinced that the only one she could love is God. What she knew of the Christian God were from stories that her mother’s friend would share with her, and from a Jesuit missionary named Fr Jacques de Lamberville who eventually baptized her on Easter Sunday of 1676. Kateri’s decision not to marry was already counter-cultural amongst her people, but even more so was her conversion to the Christian faith. Her entire village persecuted her for her faith — children would throw stones at her, they expected her to work on the fields on Sundays, and sometimes they didn’t feed her. She endured this for 2 years before finally leaving to go to Montreal, Canada to be with other Christians, as advised by a priest. For the next 3 years, she lived an outstanding Christian life — went to Mass daily, visited the Blessed Sacrament frequently, prayed the rosary often, fasted frequently as penance, cared for the sick and elderly, and taught children. Due to her poor health, she died at the age of 24. When she died, the scars on her face disappeared. Her last words were, “Jesus, I love you.” Kateri Tekakwitha is the first Native American to have been beatified and canonized as a saint.